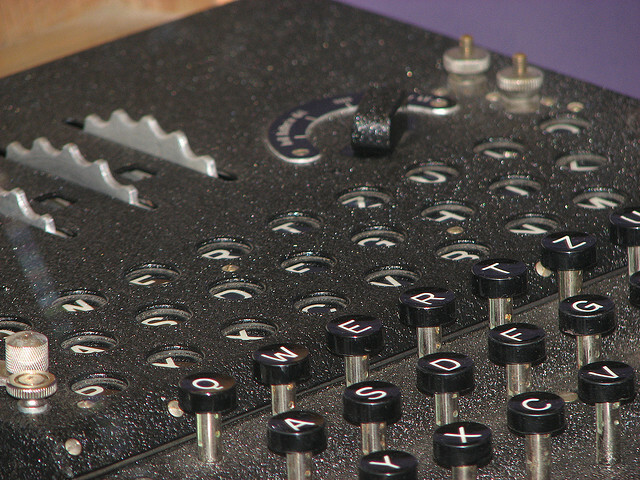 How Does The Enigma Machine Compare To Modern Encryption? Messages written in some sort of code as estimated to date back for at least 2,000 years, and demonstrate that mankind has had a desire to conceal the content of information which it wants to send to a third party for as long as he has been in existence. Morse code was invented in 1838, and is probably the world’s best-known example, remaining in use through much of World War I – until each side realised that messages could be easily decrypted if they were intercepted. As a result, when hostilities were about to flare up again, the Germans started work on developing a new way of keeping secret messages which were intended solely for transmission between staff of one of the country’s armed forces. The German boffins’ response was the Enigma machine. Effectively it was similar to a manual typewriter of the day, but it was capable of encoding any message into a code which had 150,000,000,000,000,000,000 different combinations. The machine operated by an electric current being sent from the keyboard through a set of rotors and a plugboard, which illuminated the alphabetical code which was to be used. The codes were varied by changing the order of the rotors, their starting positions, and the order of the plugboard connections. In this way, the Germans believed that their codes would be unbreakable, until the Allies realised that the only way they could do so was to build a prototype computer, and this was the job achieved by famed codebreakers led by Alan Turing, when they devised what became known as the ‘Bombe‘ machine. While other partly successful attempts had been made to break the Enigma codes, the Bombe provided the real breakthrough, and it and its team of operators helped bring the war to a swift and decisive end. They also used techniques similar to those described on this article on modern day hacking by Parcel2go, Social Engineering – The early enigma decryption relied heavily on finding cases when the German enigma machine operators had not followed proper procedure with their machines rendering the messages much easier to crack, often the same day they were received. But whereas, because it was essentially a machine, Enigma’s code-breaking capacity was limited by its physical size. The advent of modern computers powered by a microchip packing massive processing power into a tiny space, therefore, was the key to scientists’ and mathematicians’ ability to take encryption to new levels. As a result, experiments have been carried out comparing the length of time it would take for a modern-day computer to do the job of the Bombe. And a collaborative project has also been carried out in which a group of computing experts set out to break a message created using an Enigma machine which had, until then, remained uncracked. Even then, the test bypassed the plugboard, meaning that a code produced by an Enigma machine, in its original form, might still have remained unbroken to this day, showing that, while new and more sophisticated codes have been devised – and broken – since, the original Enigma remains just that. Which Apps Make the Best Use of the iPad Mini’s Dimensions?